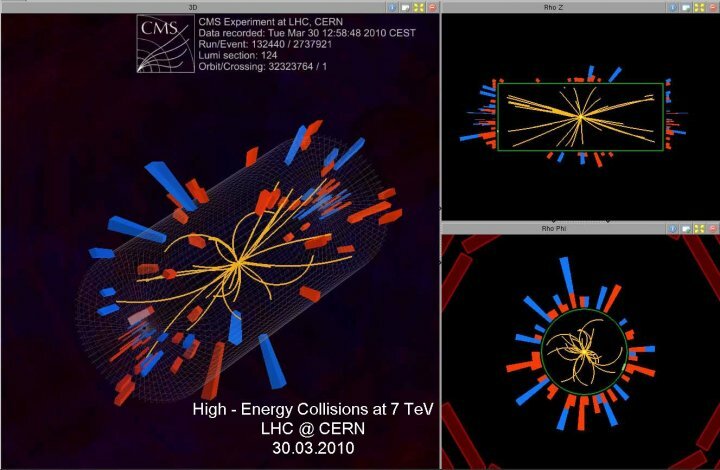 LHC: Will We Find The God Particle, Dark Matter and Supersymmetry? Could we be on the verge of a revolution of the type we saw in physics a century ago? The world's largest experiment into the fundamental forces of nature has begun in silent pursuit of the answers to some of the most esoteric questions of science, hitherto addressed by spirituality and philosophy. The Large Hadron Collider (LHC) in Geneva, Switzerland, has successfully carried out record-breaking high-energy particle collisions after scientists successfully operated the streams running in the 17-mile (27km) round particle accelerator. With these record-shattering collision energies, the LHC experiments are propelling the world's scientific community into a vast new region to explore, and the hunt has begun for the Higgs boson -- also known as the God particle -- dark matter, new forces and extra dimensions. The LHC seems to have the key to the answers for a lot of inexplicable aspects of science that just don’t add up! “It’s a great day to be a particle physicist,” said the director-general, Rolf Heuer, of the European Organisation for Nuclear Research or CERN, where the LHC is based. “A lot of people have waited a long time for this moment, but their patience and dedication is starting to pay dividends.” Fabiola Gianotti, leader of the Atlas project, said after the collisions, “It’s so intense, everyone’s feeling a big emotion, a big enthusiasm. It’s a machine of unprecedented size and complexity, but behind that are the people, and particularly the young scientists.” The LHC aims to explore the nature of the universe just moments after the Big Bang and will increase our understanding of how it was created, and what it is made of and how it will evolve. The entire project has so far cost around seven billion euros (USD 9.4 billion). The atomic particles have smashed together in head-on collisions at 7 Trillion electron volts, three and a half times the previous record. By creating ultra-high energy collisions, scientists are mimicking the conditions just after the Big Bang. The two proton beams began circulating ten days ago in opposite directions around the 17-mile (27km) circular tunnel 100 metres beneath the Swiss-French border at Geneva. The LHC is the largest, most complex scientific instrument in the world and accelerates two counter-rotating beams of protons to within a whisker of the speed of light. The beams are crossed at four points around the underground tunnel, bringing the protons into head-on collisions inside giant detectors. The collisions create tiny fireballs that mimic conditions that prevailed in the universe during the first fractions of a second after the big bang, some 13.7 billion years ago. “We are going where nobody has been before. We have opened a new territory for physics,” said Oliver Buchmueller, a senior CERN scientist. Scientists watching the event live from around the world described it as an “historic moment” marking the first step towards addressing some of the deepest mysteries in physics. Questions the LHC hopes to answer include the Higgs Boson or the God Particle, Dark Matter and Supersymmetry. Scientists hope that the LHC will eventually find evidence for the existence of the Higgs boson, a particle that theoretically explains the origin of mass but which has never been detected. Scientists believe Higgs bosons froze out as the energy levels fell. The particle was postulated in 1964 by Peter Higgs, a British physicist, and several other researchers. If the Higgs particle exists, it would suggest that there is an invisible field permeating all of space that gives mass to fundamental particles, such as the quarks and electrons found in atoms. The Higgs boson's interaction with other particles gave birth to matter in a universe that could have been filled with energy alone. The existence of an “exotic” type of matter that cannot be seen but whose gravitational effects can be felt, was first hypothesised in 1934 to account for evidence of “missing mass” in galaxies. Dark matter is the mysterious, invisible substance that hugs galaxies. Dark matter is believed to make up about a quarter of all observable mass-energy in the Universe, but only the most fleeting hints of it have ever been detected experimentally. It is so named because it neither shines nor reflects radiation. In the next couple of years the LHC experiments could lead to the discovery of a new law of physics called supersymmetry, which would explain the dark matter that seems to dominate our universe, and even consolidate the discovery of the elusive Higgs boson particle. Supersymmetry suggests that every particle in the Universe has a symmetric, heavier twin. Attractive features of Trillion-electron-Volt energy scale supersymmetry are the fact that it allows for the high-energy unification of the weak interactions, the strong interactions and electromagnetism, and the fact that it provides a candidate for Dark Matter and a natural mechanism for the breaking of electroweak symmetry. Once upon a time, the universe and everything in it were just a picosecond old. That instant occurred one trillionth of a second after the Big Bang, or about 13.7 billion years ago. At that time, the universe was not only very young, it was also extremely small, invisible to what billions of years later would become the human eye! Eventually, the universe transformed itself into the still-expanding cosmos that we recognise now, a vast, swirling extension of time and space, including galaxies, gravity, energy and matter. The LHC experiments have begun advancing the envelope of our collective knowledge a critical step closer to recreate the conditions of the universe as they existed in that trillionth of a second. Countless mysteries continue to surround the long cosmic journey from that first picosecond, but some of those riddles -- the nature of mass, the secret of dark matter, the puzzle of black holes and the possibility we live in a realm of 10 or more dimensions as opposed to three spatial and one temporal -- may soon be revealed thanks to the LHC. Imagine the consequences of that for our collective humanity and the ever onwards march of our global civilisation!